The MS-1 is a Soviet tier 1 light tank. It is the smallest and lightest of the tier 1 tanks. 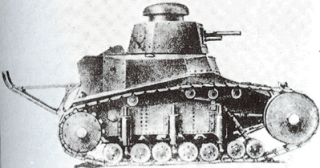 The vehicle possesses features that make it visually and visually unique; the MS-1 has external features which resemble a "hat" and "tail"(the "hat" being the tier 2 MS-1 turret Mod.1930, and the "tail" being the trench tail attached to the rear of the hull that would have assisted the tank in maneuvering out of trenches) , and the engine makes a distinctive "puttering" sound. The MS-1 has two tier 2 gun mounting options after researching the tier 2 turret. Their characteristics are as follows: When equipped with the 23 mm VJa , one will notice a reduced shell damage, a slight loss in penetration and aim time, yet an exponentially increased rate of fire when compared to the stock gun - The 37 mm Hotchkiss. This gun can be played effectively when in close quarters ( the 0.54m of dispersion should shy any tanker from equipping this gun to "support snipe" with) or when using the peek-a-boom tactic. The rate of fire is the highest of its tier and can be used to ward off any enemy trying to push a flank on your team. This gun is better suited for those who would rather use the MS-1 in an assault style of play. When equipped with the 45 mm mod. 1932 gun, it has the damage potential to kill any other tier 1 tank in approximately three shots. This damage rate, when combined with the 45 mm gun's penetration (superior to all other weapons found on tier 1 tanks), makes the MS-1 a formidable opponent in tier 1 battles. The reload of this gun is , however, much poorer than that of the 23mm VJ; therefore, more conservative tactics should be used when running this gun. The MS-1 is a very capable tier 1 tank, and also quite beginner-friendly, making it an excellent starter tank. Stock, it is slower and weaker than the American and German starter tanks, but it has the thickest armor. The frontal armor is almost twice as thick as the T1 Cunningham's (although 18 mm of armor is not going to stop much incoming fire). Against this, the MS-1 has the lowest HP of all the tier 1 tanks, and cannot take too many hits. The starting gun, the 37 mm Hotchkiss, is decent enough against other tier 1 tanks, but is very inaccurate. The 37 mm B-3 is a great improvement, offering superior penetration, damage, and accuracy to the Hotchkiss gun, while the 45 mm mod. 1932 is the probably best single-shot weapon available to any tier 1 tank. It has the highest damage and penetration for its tier and will have no problem penetrating all but the most heavily armored tanks the MS-1 faces. Sniping with this gun can be very effective. The high damage per shot also makes it excellent for taking "snap shots" while playing "peek-a-boom" (moving out of cover, taking a quick shot at close range, then moving into cover again). Be mindful that all three single-shot guns have very long aim times (2.5 s). The MS-1 is not particularly well-suited to the play styles that auto-cannons demand, especially since it is one of the slower tier 1 tanks. Despite this, the 20 mm TNSh and 23 mm VYa are still viable if the MS-1 can close the distance. The MS-1 has the lowest horsepower of all the tier 1 tanks, and is one of the slowest for its tier. It is decently maneuverable, with fair hull traverse and excellent turret traverse speeds, but can have trouble climbing steep slopes. Combined with the excellent single-shot guns it has access to, this makes the MS-1 well-suited to a more careful and deliberate play style, as opposed to the more aggressive play styles of the Leichttraktor or T1. The MS-1 is also one of the smallest tanks in the game, making it much more difficult to both detect and hit, compared to the other tier 1 tanks. With a Camouflage Net, it is nearly invisible until it fires. 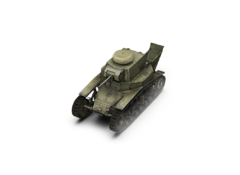 The 37 mm B-3 is required to unlock the modernized turret, which in turn unlocks the 45 mm mod. 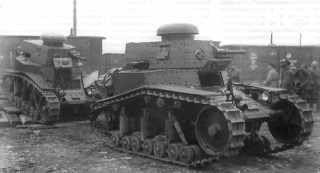 1932 and T-26. Upgrading to the GAZ-M1 engine is very helpful since it is both more powerful and weighs less. The T-18 suspension provides a welcome increase in the fairly low load limit. The 45 mm mod. 1932 is required to unlock the AT-1 tank destroyer, and is highly recommended. The 20 mm TNSh and 23 mm VYa autocannons are not required to unlock anything, and are not necessary except to provide the MS-1 with elite status, or if a more aggressive close combat play style is preferred. The AMO-3 engine does not provide much significant benefits over the GAZ-M1, and can be saved for last. It is required to unlock the BT-2. 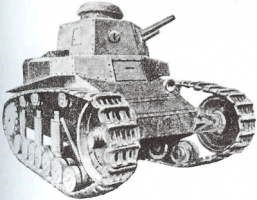 The MS-1, Russian: Maliy Soprovozhdeniya-Perviy, "First Small [Vehicle for] Support") was a late 1920's designed Soviet light tank. Produced from 1928–31, it was based on the Renault FT-17, with the addition of a vertically sprung suspension. At this point in time, Russia did not have any specific armored warfare divisions or units, so a new Special Bureau was specifically created and its first specification tender was for a 3 ton, 2-man light tank capable of 7.5 mph (12.1 km/h). It would be protected by 16 mm of armor and equipped with a 37 mm (1.5 in) gun. By early 1925, the total weight had increased to 5 tons. A "Tank Bureau" was formed in May 1924 for the development of Soviet tanks. A specification was issued for a 3-tonne two-man light tank capable of 7.5 mph (12.1 km/h). It would be protected by 16 mm of armor and equipped with a 37 mm (1.5 in) gun. By 1925 the allowable weight had increased to 5 tonnes. The tank was designed by Professor V. Zaslavsky at a new Tank Bureau set up under the Central Directorate of Military Industries. The 35-horsepower truck engine (a copy of the Italian FIAT 15 ter) was supplied by the Moscow AMO Factory, and the gun was a modified copy of the French 37 mm Puteaux SA 18 cannon. The sprung suspension which would allow a tank to travel faster over rough ground was the biggest improvement over the Renault. A prototype called the T-16 was tested in June 1927. The T-16 was deemed a failure, as it had problems with its transmission failing too often and its inability to cross trenches more than 1.5 meters wide. The T-16's maneuverability was only marginally better than that of the Renault. Meanwhile the КБ ОАТ drew up plans for an improved version of the T-16 which was accepted for production in July as the T-18, with the tank additionally noted as an MC-1 ("low maintenance type 1"). It was the first Soviet tank adopted for serial production. 959 vehicles were produced from 1928 through 1931. Service in the forces of the first Soviet tanks did not leave behind a large number of clear combat examples. 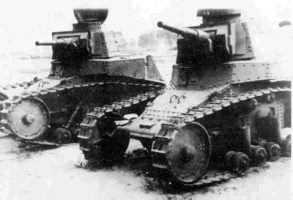 An experimental company equipped with T-18s took part in defending the Far Eastern Railway against Manchurian forces in 1929. They were removed from service in 1932 and given over to training. Following the German invasion of the Soviet Union a number of MS-1s were given 45 mm (1.8 in) guns and entered service as the T-18M. MS-1 (aka T-18) Light Tank at battlefield.ru. This page was last modified on 17 June 2018, at 00:44.